Hopefully you know by now that wearing flip-flops or high heels is a bad idea if you're trying to operate a motor vehicle. What about other shoes, though, like good old-fashioned sneakers? You might find this hard to believe, but sneakers -- tennis shoes, running shoes, whatever you call them -- can literally contribute to an accident. In a Final Destination scenario, you don't want your last thought to be, "Damn, I really hate these clumsy shoes!" do you? Of course not. 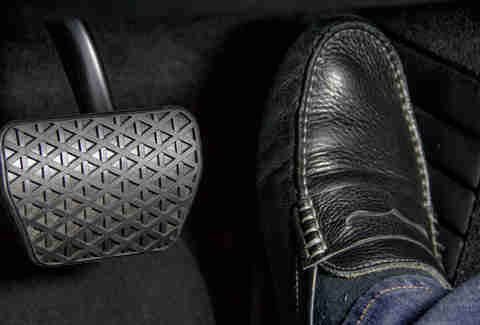 The average driver will hit the wrong pedal between 11 and 20 times per year, according to government estimates. That doesn't just mean completely confusing the gas for the break and barreling into the side of your neighbor's house. It includes grazing the brake as you push in the clutch, or leaving part of your foot on the accelerator while braking. Even if you don't realize you've done it, the potential for dramatically increasing your braking distance in an emergency is as obvious as it is alarming. Now think about athletic shoes, which have really, really wide soles to help with stability and keep you from getting injured when you're active. In a car, that width is a pretty big disadvantage. 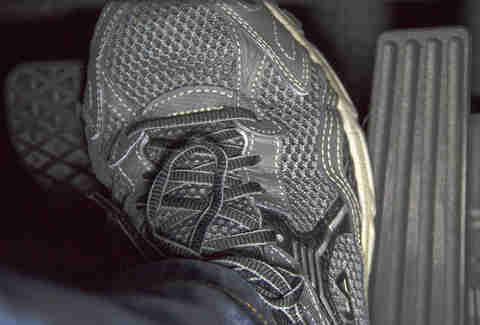 While no study exists that specifically looks at the role of athletic shoes in accidents, it's a logical assumption that if the average person hits the wrong pedal up to 20 times a year while moving his or her foot sideways from one pedal to another, then the wider the shoe, the greater that number -- and the greater the chances of it leading to an accident. By the way, this is precisely the reason why I also highly suggest learning how to brake with your left foot. If your friend for some reason couldn't feel his or her feet, you wouldn't say, "Hey, drive my car. It's cool." That's essentially what happens when you drive in sneaks; those nice thick soles might feel wonderful and cushiony while you're running, but in the driver's seat, you're sacrificing your feel for the pedals. If you go out to your car right now, take off your shoes, feel the pedals with your feet, and pretend you're driving, you'll notice exactly how much more control you have. It's the same reason a tightrope walker needs to feel every millimeter of rope, or why NFL kickers have been known to wear special shoes to increase their field goal-kicking accuracy. If you've ever seen a pair of "drivers" in a shoe store, it's not just a name. 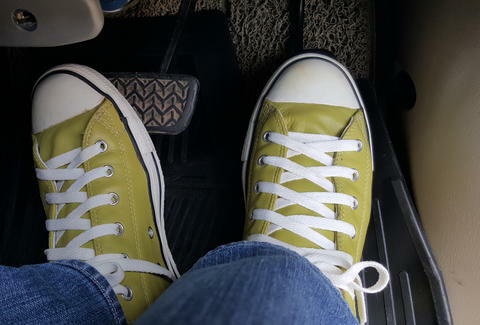 They're shoes specifically made for driving, and as it happens, they're usually pretty darn good-lookin'. They're not very wide, the soles are nice and thin, and a really good pair basically feels like leather mittens hugging your feet. Any thin-soled shoe is a good driving shoe -- when you step on something like a pencil, you should be able to clearly feel where it presses into your foot. In the car, you won't just feel the pedals, you'll feel exactly what part of your foot is on what part of the pedal, and you'll have way more control when you're accelerating, braking, and most importantly, when you're transitioning from one to the other. Aaron Miller is the Cars editor for Thrillist, and can be found on Twitter and Facebook. He started wearing Converse Chucks when he was 15, and progressed to shoes that are basically slippers. He has no regrets.